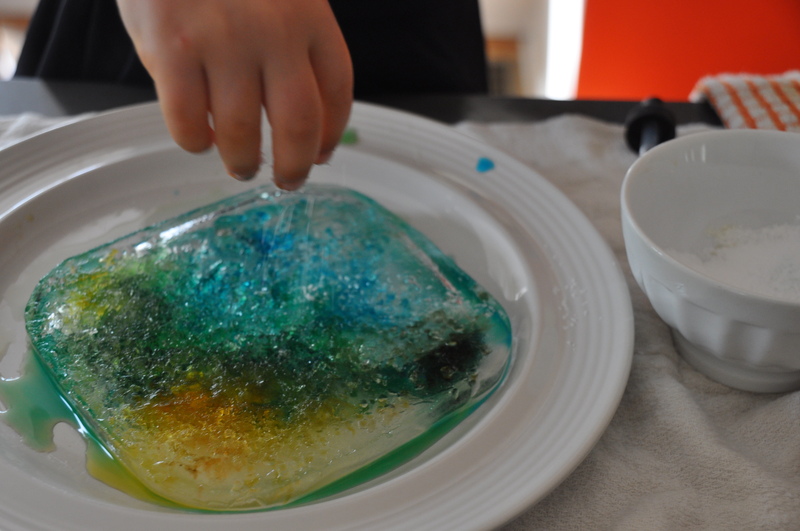 I’m not sure how many kids ask their parents, “Can I do food coloring?” Perhaps more than I can imagine. 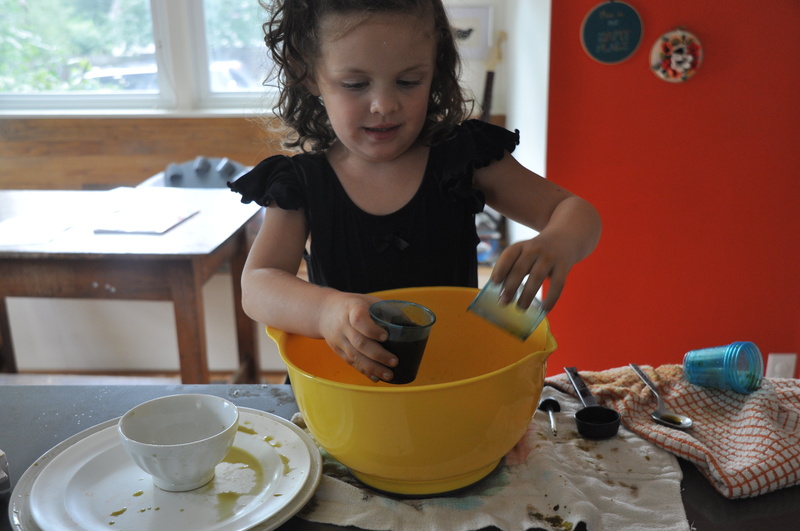 Cora has been doing food coloring since she was one. That’s when we started taking a set of translucent tupperware containers (red, yellow, and blue + one clear) into the bath to transfer colored water from one to another and watch the magic. Last year for her birthday, we filled squirt guns with colors and she and her “friends” made some collaborative paintings (see Paint by Squirt Gun). 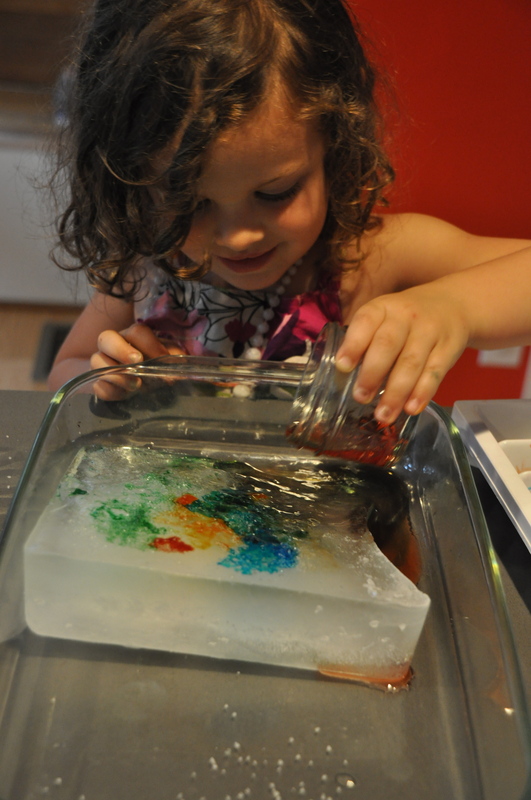 This summer, after our freezer was accidentally defrosted and refrozen by our very well meaning dog sitters, we harvested a giant clump of ice and got busy pouring with salt food colored water on it. Thanks again Tinkerlab for a great invitation! 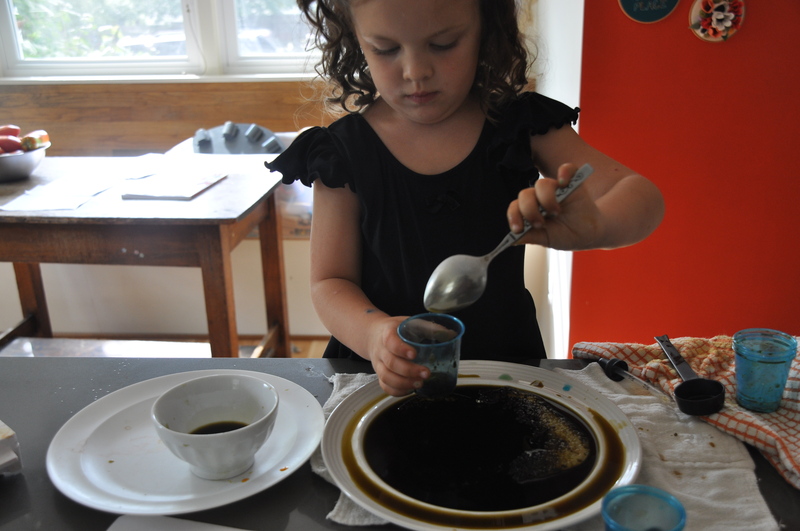 These were all exciting experiences that provided us both “permission to play.” But the fun really began for me this weekend when Cora asked for food coloring and made her own choices about what to do with it. Her actions echoed those from the past, but she was the master of ceremonies, determining the tools she needed and the order of events. Here’s a quick recap. While Cora was ready to line up 50 cups to play with, she settled on 5, which turned into 6 once we realized we needed another to complete a rainbow of colors. After that, she asked for a plate to put them on. I gave her two; one dark blue, one white. She moved the cups from one plate to the other talking about how they looked different one each. Then came the request for “a block of cheese.” It took awhile, but I finally realized she meant a block of ice. 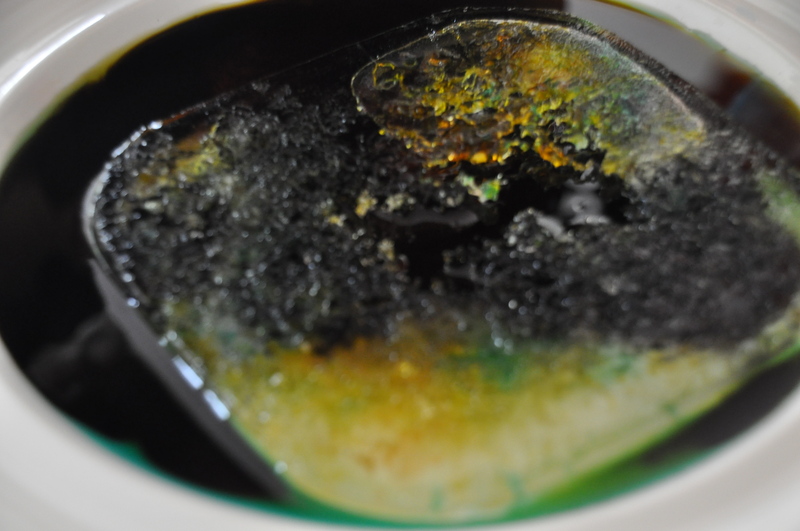 So, we filled a square tupperware about a 3/4 of an inch with water and found some other things to do while it froze. Later that afternoon, she asked for the ice. We popped it out of it’s mold and Cora got busy. Once the ice was significantly melted, she poked at it with a spoon which then turned into a scooper. 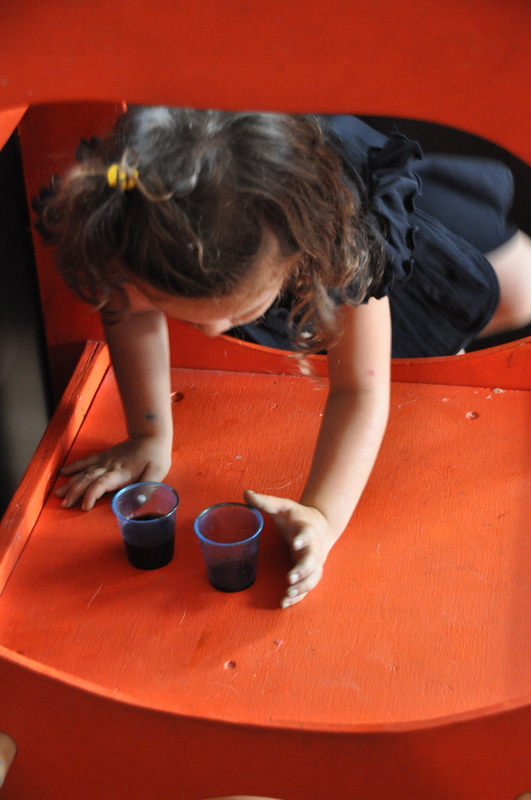 Once she had some cups filled up, she asked for a bowl to dump them into. Then she refilled the cups and carried them over to the sink for one final dump. Game over. 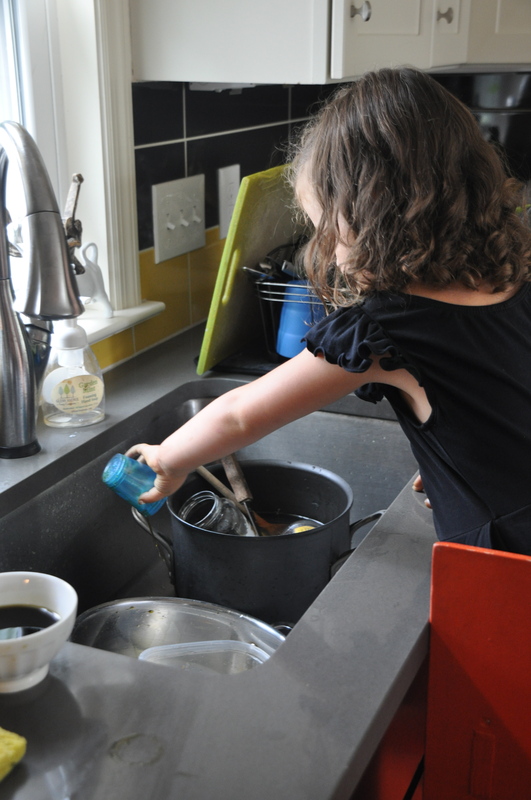 It was a VERY busy day, with lots and lots of dirty dishes to be done. This entry was posted in Crafty Cora, Permission to Play and tagged Art of Young Children, Creative Development, Creative Invitations, Food Coloring, Material Experiments, Material Exploration, Permission to Play, Preschool Art, Process Art, Tinkerlab by jodiK. Bookmark the permalink. I love this. 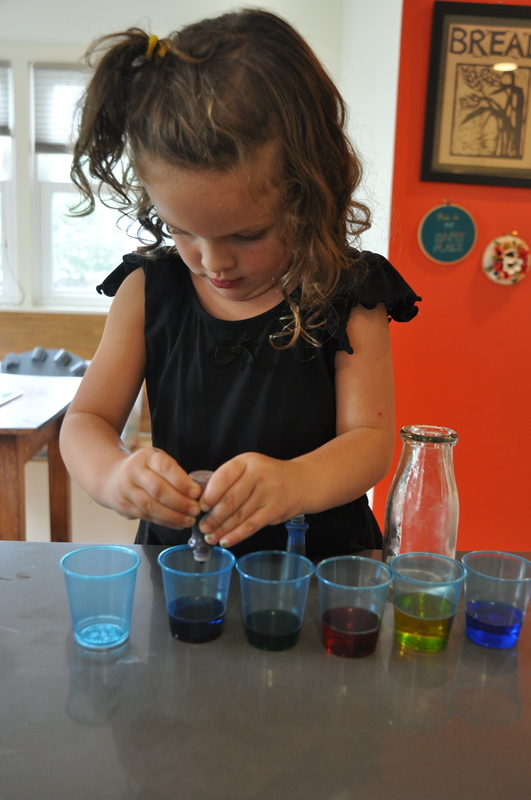 Abe does something similar- he calls it making potions. He fills little cups with left over coffee, milk, different juices etc. and mixes them into cups and bowls. Always interesting to see what he comes up with.